To submit your beloved pet to our rainbow page please click here. I fell in love with Darla the minute I saw her at 10 weeks of age! She started my love of Pugs. She was my little Queen and she knew it! I miss her terribly, my true companion, my little girl. I know she had a good, long life. She will always be so very special to me. Sadly missed by all the family; her eyes full of life, her loud snoring and her love of cheese. 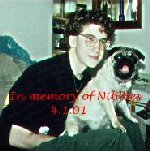 Nibbles was my baby, my clown and companion. I will miss her with all my heart, mind, body and soul. JonLuc was not just a dog, he was my baby. He was buried at Pet Rest Memorial Cemetery in Sachse, Texas. We put a Saint Francis (as a little child) concrete statue on JonLuc's grave and the headstone is being made now to read "Daddy's Boy". "Mama's Baby". His death was so sudden. The vet said it was some strange blood disease similar to leukemia, but not leukemia. We miss him so badly.